The only things this film had going for it were some great, washed out cinematography and some cool, albeit cliched, kills. It was completely unoriginal, has a weak script, stereotypical characters, and reads like the instructions on how to put on a condom. To sum it up, it's utterly forgettable. Don't waste your time, but if you want to know more, read on. A thin setup of tourists composed of rich Chinese, a couple of blonde party girls, a drunk and obnoxious Frenchman (I take it Icelanders don't like the French? ), among others get onto a former whaling boat. 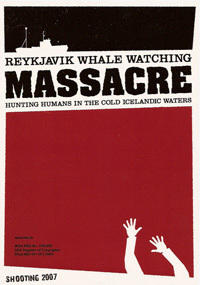 I say former because the first part of the film is intercut with how the Iceland whaling industry has been decimated by the government and the "American tree huggers". Admittedly, I dug this overtone, but it just provided an overall feeling of anger from the locals and not much else. Anyways, they go out into the water and some people get murdered. The end. The DP did some great work and had a few stunning shots, especially with a decapitation and I hope this guy gets more work. He must of been using filters and slight out of focus for some of the shots as he clearly knows what he's doing. The kills? Cliched like I said, but they provided some respite for the 90 minutes of garbage I would of turned off after 10 if I didn't have to review it. This isn't worth any more typing but I'll give you one more adjective: Formulaic. Skip it. Would HAVE. Must HAVE. Community college degree in journalism?